The bulgogi is a Western chef’s biggest nightmare. The grilled meat is usually drenched in marinade, bordering on chewy and more often than not, left too long on a smoky tabletop barbecue. The taste is nowhere near the consistency of a tender steak, yet everyone laps up this Korean staple. Perhaps half the allure lies in the communal experience of swishing your meat on a shared grill and knocking back a few beers with a couple of friends. Sometimes, food takes a back seat in Korean dining – it’s all about the company. Jung Won is specially designed for such camaraderie. 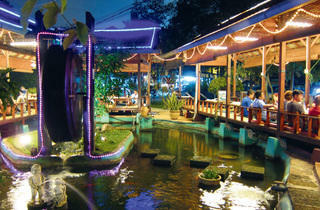 There’s a visible concentration of Korean eateries in Ampang but some of them are well-hidden like Jung Won. 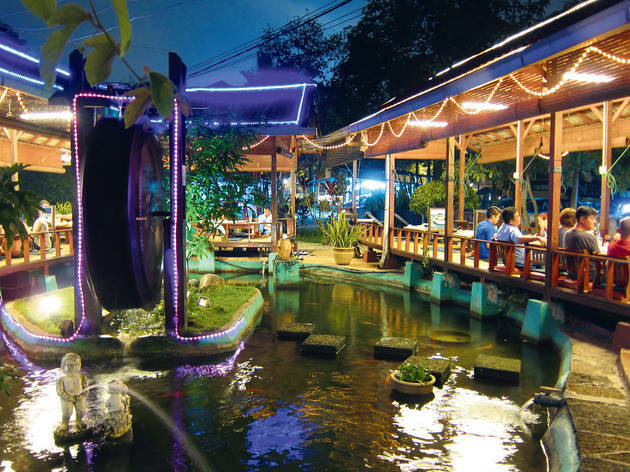 Owned by a Korean and located just behind Sayfol International School, this restaurant is evocative of a quaint village, spruced up with a water wheel, a koi pond, swings, fairy lights and long wooden pavilions where you dine cross-legged. While grilled meat is a ubiquitous dish, some Korean restaurants clearly execute it better. Jung Won’s dung sim ju mul ruk (grilled marinated sirloin) is driven by a sweet marinade (a combo of soy sauce, pear puree and sesame oil) but not monopolised by it. You’ll stand before this dish and sigh, for you know these thin slices of juicy beef – edged with just the right amount of perfectly seared fat – will require 50 more push-ups at the gym. Eat the meat with lettuce like a ssam (wrap) if it makes you feel less guilty. The run-of-the-mill but elaborate selection of refillable banchan (side dishes) hardly matters when you have a scene-stealer like kimchi soup. The puckery-spicy broth comes roiling in a hot stone pot, and a quick scoop reveals ingredients such as tofu, leek, onions, cabbage, green chillies, glass noodles, pork chunks and of course, kimchi. This belly-warming soup easily stands in as a meal but you can also pair it with rice or a savoury pancake like a seafood pajeon (think Asian-style pizza with lots of spring onions). Over the years, Korean restaurants have resuscitated our drab dining scene but the biggest problem with them, including Jung Won, is the unimaginative menu. I’m all for traditional Korean cuisine but the fare seems uninspired, predictable and repetitive, like Xerox food – you’d expect the steep price tag to come with a bit of a surprise. Just beware of the staff who tend to take things into their own hands: They automatically served me pork kimchi soup without informing me there was a chicken option. Here’s a reminder to all K-restaurants: Unlike K-pop bands, you’ll need more than a pretty face to earn devoted fans.